Club Penguin Elite Penguin Force: Herbert’s Revenge Mission Guide’s | Fosters1537 and Yellow Crown's Club Penguin Guide! Step 1: Your agent phone will ring. Answer it by tapping your DS stylus on it. You will then be transported to the Elite Penguin Force Headquarters room. Step 2: Once there, talk to the other 3 members which include Jet Pack Guy, The Rookie, and that one Purple penguin. Step 3: The director will pop up on the screen. He will explain how you will have to pass a couple of test’s. Step 4: Continue to talk to the director. TIP: If you don’t know who Herbert or what the EPF is, then make sure to click the dialogue box asking what it is when you are speaking to the director. Step 5: Once done talking to the director, you and the other 3 agents will be in a cave. Talk to the puffle trainer and you will learn about you puffles. Step 6: Go into the left door. Make sure you finish talking with everyone before you go in. Step 7: Once inside, take out your Red Puffle. Use him to smash the two crates in the room. Step 8: Use the Blue Puffle to hit the three targets. The door will then open up, and you will go back to the cave. Step 9: The director will pop up on a TV after you talk to the Rookie and all the other penguins. You will then go into a cave in the center of the room after he is done speaking to you all. Step 10: Once there, you will need to get across the stream. Collect all three items in the box. Step 11: Take out the drill and put it in the stream water. Then use it to drill into the hole on the left side of the room. Step 12: Play the mini-game with the drill. Make sure to read the instructions the game gives you so you fully understand how to play. Step 13: After finishing the mini-game, talk to the other 3 agents. Step 14: Combine the grapple hook and the rope together. Play the grapple mini-game. Read the instructions closely. Step 15: After finishing the mini-game, you’ll be in a cave with a cage in the center. You can’t get through because there are steel bars blocking it. Talk to all three agents and take their items. Step 16: Use the belt to put it on the two steel bars. Combine the Jet pack and the Stick, and then put it on the belt. Step 17: Rotate the Jet Pack and Stick around the belt, so that the bars will crunch up. Step 18: You can now go through the bars! Step 19: Final test! No items allowed! Talk to the other penguins and stack the 3 on your arms. This is the order. B. Jet pack dude on top of you. C. Purple penguin on top of Jet Pack dude. D. The Rookie on top of the Purple penguin. Step 20: They will hop over the gate and open the gate up for you. You become the leader of the team! Mission success! Step 1: Talk to the director. Step 2: Then talk to Gary. He will give you your spy equipment like the comb, wrench, etc. Step 3: Gary needs to tighten the last screw on his new machine, so click on the machine with your stylus. Then take out your wrench and tighten the bolt. Step 4: You will then be in the old HQ. Go to Gary. He will say that the machine has a piece of fur stuck in it. Step 5: Tap your stylus on the machine and use the comb to pull it out. Then scan the fur he gave you. The results will come up with unknown. It will identify that there is hot sauce, hot chocolate, and jet pack fuel on the white fur. Step 6: Gary will tell you that you need to get those 3 items so he can use them to make special glasses that will help track down the unknown white fur creature. Step 7: Get the jet pack fuel at the top of the beacon. Use the purple puffle to blow a bubble and get the jet pack fuel on a balloon. Step 8: Go to the pizza parlor. Get the hot sauce in the crates. Then take the pizza on the counter, and deliver it to the penguin in the Ski Lodge. Make sure to get a bottle of chocolate syrup in one of the other crates in the Pizza Parlor. Step 9: Get the hot chocolate by fixing the coffee machine. Use your wrench to tighten up the milk tube that connects to the coffee machine. Then put the temperature on the coffee machine to the max, and put the chocolate syrup from the Pizza Parlor in the top of the coffee machine. Make sure you grab the white mug, and click the hot chocolate button. Bam! You got hot chocolate! Step 10: Put the hot chocolate in your inventory. Step 11: Go back to G and pour all three elements into the goggles to make them work. Then put the goggles in your inventory. Step 12: Go to the Beach. Grab the net by the entrance. Then go into the Lighthouse, and grab the rope on the boat. Step 13: Go to the Ski Lodge. Grab the candle in the room, and head out into the fishing area where you play that fishing game in Club Penguin “Gone Fishing”. Step 14: Combine the net and the rope, and place it on the tree. Then put the candle on the net, and walla! You have a trap! Step 15: A crab will get caught in the trap. Take him back to G. There will also be another piece of white fur that you will pick up before you go to G. The fur will fall off the suspect as soon as the Crab gets caught, and the bear makes a run for it. Step 16: Take the crab back to the HQ, give it to G, and scan the white fur. It is a POLAR BEAR! YIKES! Step 1: Talk to G. He will try to get the Crab to talk by using a special machine. The machine will break, and the crab will escape. Step 2: Follow that crab from the HQ, to the Sports shop, to the Ski Village, to the top of the Ski Mountain, and to the edge of the Ski Mountain. The crab will fall, and so will you. Step 3: The crab will run through a mini door. You can’t go through. Step 4: Make your way around the forest. When you get to a section of the wilderness where there are Puffle berry-o’s, use your scissors to cut them down from the tree. Step 5: Now find the black puffle, give him a puffle berry-o, and he will follow you. Go back to the door where the crab went through, and toss another Puffle Berry-o through the door, and the black Puffle will open up the door for you. Step 6: Once in the door, you will be captured, and Herbert will come out of the shadows and explain his mastermind plan. Step 7: He will run out, and you will be trapped in a cage. Put a Puffle Berry-O on all the different contraptions until you open the gate. Step 8: Once out, grab the anchor, the blueprints Herbert stole, the rope, and the hot-sauce. Then combine the hot sauce with the puffle berry-O’s, and feed one to the Puffle. He will go on fire, and burn a hole through the snow that is blocking the door. You’re out! Step 9: Wind your way around to the mountain top. Combine your rope and anchor together, and tap your stylus on the top of the mountain. Step 10: Play the mini-game. Make sure you read the instructions very well so you understand the game play. Step 11: Once at the top, go talk to G. Give him the blueprints, and go to the Ski Lodge. Herbert is trying to destroy the Ski Lodge! You need to make a distraction! Step 12: Go to the Pizza Parlor and get a vegetarian seaweed pizza from the clerk penguin at the front desk. Step 13: Pop the pizza out in front of Herbert. He will start eating it. Then the crab will knock him into the ice. Step 14: Talk to G. You win! Step 1: Talk to G. There will be weird tremors going on at Club Penguin. Go to the Dock after talking to G.
Step 2: You will encounter Herbert. Talk to him and he will go drilling down into a hole with a giant drill he constructed. Step 3: Grab the light he left behind. Then go to the Town. There will be two pieces of map you will need to help solve the underground caves Herbert made. One of the pieces will be on the top of the Nightclub. Go back to the Gadget room, and grab the light brown hat on the hook hangers near G.
Step 4: Now go to the Coffee Shop, talk to the worker penguin, and clean up the spilled cookies. Once you are done cleaning them up, talk to the penguin and he will give you a cookie. Step 5: Go back outside to the town, feed the green Puffle the cookie, and put the hat you got from the Gadget Room on him. He will then fly up and get the map piece. Put the map piece in your inventory. Step 6: Follow the other map piece from the Snow Forts to the Plaza. The other map piece will fall into the green penguin’s newspaper who is waiting in line for a play at the Stage. Step 7: The penguin appears to be hungry, so go to the Pizza Parlor, talk to the clerk penguin working there, and get a meat pizza. Give the pizza to the green penguin in exchange for the map piece. Step 8: You have both pieces! Combine them together, go back to the dock, and down the hole you go! Step 9: Turn the light on you got earlier, and go into one of the two tunnels. Step 10: Play the mini-game! Make sure you read all instructions very carefully so you understand how the game works. Step 11: Once done, you appear to be under the Gift Shop! It is under the ground. Step 12: Go to the Beach, and grab a net near the lighthouse. Then go inside, grab some rope on the boat, some shaking cream soda, and a pack of balloons on the band stage. Step 13: Then go to the Gadget Room and grab the Balloon Helium Inflater, and the hammer. Make sure you ask G before you take the items. Step 14: Now go to the Sports shop. Take the pegs outside of the Tent display inside of the Sports store. Step 15: Now go to the Gift Shop, use the net to put it under the gift shop. Then put the pegs on the net. Use the hammer to put the pegs in the ground. Finally, grab the balloons and combine them with the helium balloon pump. Put the inflated balloon on top of the gift shop. Step 16: You fixed the Gift Shop! Step 17: Go back down the hole in the dock. The door leads to the Boiler room! Step 18: Herbert is in there! Talk to Herbert. He destroyed the Boiler! Step 19: Your agent phone will ring. Answer it, and G will tell you to fix the Boiler. He will hang up. Step 20: Tap the Boiler and fix the pipes. Make sure you follow the instructions. Step 21: After the Boiler is fixed, G will call and tell you the pressure from the Boiler stopped. Step 1: Talk to G. You need to put three radar’s around Club Penguin to help track your Agent Phone. You need to track your Agent phone because Herbert has it. Step 2: You will need to take the rubber ducky, and the kite blueprints in the HQ. Step 3: The first radar you will place at the mine. Talk to the orange penguin. You have to fix the side of the mine. Click on the side of the mine and slide the board pieces of wood that support the water pipes to the side to make the top water pipe turn to the bottom left. You have to experiment with moving the planks so you can get enough room. Step 4: Once done, talk to the orange penguin. He wants you to fix the mine cart. Tap your stylus on the mine cart, and weld it with a torch so the cracks will get sealed in. Once done, put a radar you got from the HQ in the cart, and it will go down the mine. Step 5: To get the second one, go to the plaza, talk to the penguins near the stage, and follow their instructions. Then ask for their piece of gum. Then go to the Dock, fix the penguin’s boat by asking the penguin.Tap your stylus on the boat, and pull back on the motor rope three times to start the engine. Step 5: Use the gum to patch up the hole in the rubber ducky. Step 6: Once you are done starting the boat up, ask to borrow the penguin’s pump. Use the pump to inflate the rubber ducky. Then take the rubber ducky to the Ice Berg, put a radar in the rubber ducky, and put it in the water. Step 7: Get the third one by going to the forest and getting the sticks on the ground. Get the rope in the attic. If you want, you can find the find four pieces around the Ski Lodge, and give it to the 2 penguins trying to play Find 4. Step 8: Then combine the sticks with the kite blueprints, and then put the rope on it. Attach the last radar onto the kite you just made, and go to the Mountain top. Step 9: Attach it to the top of the pole. G will call. Report to the HQ, talk to G, and take the Binoculars 3000. Go down to the side of the Ski Lodge where the ice fishing area is, and tap your stylus out into the open of the ice pond. You will see Herbert. Once he leaves, G will call. Step 10: Get across the ice by playing the mini-game. Make sure you read the instructions for smooth game play. Step 11: Once done, G will call. Grab your spy phone, and combine it with the Binoculars 3000. Stick it on a tree, and G will call. Report back to the HQ. Step 12: Talk to G and watch the surveillance camera of Herbert and the Crab. Finish up talking to G.
Step 2: Grab the solar panel on the right hand corner of the screen. Step 3: Go to the Beach. Jet Pack Guy will have his jet pack broken down. Step 4: Go into the Lighthouse and grab the barrel of soda. Give it to Jet Pack Guy. Step 5: Divide the soda into equal portions. Click on the bottle at the bottom left hand corner of the screen for help. Step 6: Once done, Jet Pack Guy will fly off. Step 7: Go to the Dock, and get the rope from the lime green penguin near the Dock tubes. Step 8: Go to the Gift Shop. Talk to the Rookie, and put the solar panel on the giant magent. Step 9: Now talk to Rookie. He wants you to set up the giant magnet. Follow the instructions it gives you on-screen, and connect the blue, yellow, and red circuits without them overlapping. For the Bonus Item: Want the extra bonus for this level? Talk to the clerk penguin at the gift shop, grab the table, colored eggs, and clothes items that the penguin tells you to grab, and place them outside of the Gift Shop. Then, go to the vault and use the black puffle to weld the hinges! Step 10: Go to the Night Club, and put the rope into the lever box. Try touching the lever with your stylus. The machine will break. Step 11: Take out your wrench and loosen all 4 bolts in the lever box. Once done with that, follow the on-screen instructions by connecting the gears onto the right areas. Step 12: Answer Jet Pack Guy on the phone, and go to the Dock. Step 13: Answer the call from Rookie, and go to the Night Club. Step 14: Uh-Oh! Herbert is here! Talk to him and pull the red lever on the lever box. Herbert will be trapped. Talk to him again and answer the call from G.
Step 15: Now talk to the Rookie, and shine the lights at the top of you by tapping them. By clicking them all, they will make the magnet solar panel stronger. Step 16: Herbert will escape by stealing the Rookie’s phone! Now finish up by talking to G and the rest of the gang. Step 1: Talk to G. Then go to the Gift Shop, and talk to Rookie. Step 2: Now get the corn kernels below him, finish talking to Rookie, and go upstairs to the Staff room. Step 3: Talk to Jet Pack Guy. Now get the corn kernels near the computer. Finish up with Jet Pack Guy, and G will call. Answer his call, and go to the HQ. You have to waddle though, so open your map and go to the Sports shop to get there. Step 4 : Once there, Herbert will take over the HQ. Talk to Herbert, then finish up talking to Gary and the agents. Step 5: Go to the Lighthouse, talk to the lime green penguin on the stage, and take out your wrench to fasten his guitar. Now ask for the DVD case. Step 6: Grab the DVD on the ground and clean it by following the instructions on the screen. Step 7: Go to the Ski Village, and talk to Rookie and Jet Pack Guy. Give the DVD to Rookie, and he will put the DVD in the DVD player. Step 8: Tap the DVD player with your wrench to loosen the 4 bolts on the side of the player. Step 9: Go to the Mine. Go through the maze by playing the Tunnel game. Read the instructions if you like to ensure that you know how to play. Step 10: Once out of the game, you’ll find yourself near a river. Use the white Puffle to shoot ice across the river. Play the maze game again. Step 11: You are now in front of a ladder. Use your red puffle to hit the ladder down. You can also put the popcorn kernels in the left torch if you want instead. Step 12: Talk to Herbert once you reach the top. He will explain his diabolical plan. He will then transport you back to the HQ. Once there, you will realize there is a popcorn BOMB in the stolen salon chair that Herbert stole earlier. Step 13: Talk to Jet Pack Guy, Rookie, and G. Now go to the right until you see a couple of books on a table. Tap them, and you will have to follow the on-screen instructions for UN-locking the secret door. Step 14: Once unlocked, Dot will appear. Talk to her, and go into the secret door with the rest of the agents. Step 15: Once outside, the PSA will explode popcorn everywhere and destroy the HQ and the Sports Shop. Step 16: Finish up talking with the other agents like Dot. Coming soon. Sorry for the delay. Step 1: Talk to all the agents. Get the Heads-Up 3000 from Gary. Now use the special map to look for clues. Rookie has a “Wheel of Focus” that you have to spin with your stylus and land on a magnify glass, Dot has a costume switching game, and Jet Pack Guy, you have to tap the middle of the landing pad. 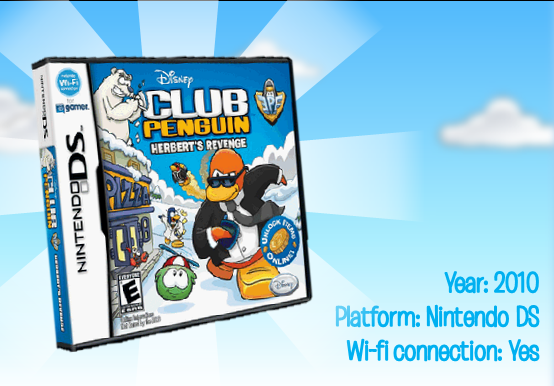 Step 2: After collecting 5 clues, you will see a cut scene of Dot, Rookie, and Jet Pack Guy landing at the Ice Rink. Step 3: Talk to Gary. He will give you a grappling hook and a drill. Go after the arrows for Rookie’s location. Keep following them. If your signal starts dieing, you will see an X where the arrow is. Step 4: Once you stop following, you will be in the wilderness. Go to the mountain and play Grapple Gadget. Read all instructions for smooth game play. Step 5: Once done, you’ll see Rookie. Talk to him. Now get your Green Puffle and grab Rookie’s hat. Put the hat in your inventory and give it to Rookie. Take the fishing line from Rookie. Now use the yellow Puffle by calling it with your whistle. Use the yellow Puffle to break the ice around the cage with the black and blue puffle’s. Finish up the cage by taking out your wrench and twisting out the 4 screws. Step 6: Now take out the yellow jackhammer, and play the jackhammer game. Read all instructions if you don’t know how to play. Step 7: Talk to Jet Pack Guy. Now take the fishing line and reel Jet Pack Guy in by reading the on screen instructions. Once Jet Pack Guy is reeled in, disable the Jet Pack with the yellow Puffle, and cut the rope around him with your scissors. Step 8: Use the blue puffle to break open the yellow balloon that the purple Puffle is in. Now go back down to Rookie, and go to the right hand side of the mountain and play Amazing Maze. Step 9: There will be a fake tree in front of you. Use the red Puffle to break the fake tree off. Dot will be inside a cage with a pink puffle. Grab all the propeller and all four blades around the snow and put them back together by combining them in your inventory and following the on-screen instructions. Step 10: Once done with that, put it on the windmill. Then use the black Puffle to weld the windmill. Step 11: Now go to the right hand corner of your screen and take out your grapple. Play Grapple Gadget. Step 12: Once at the top, talk to all the agents and Herbert. Grab all 6 slabs of ice and follow the on-screen instructions to reflect the light up to the giant magnify glass. Step 13: Finish talking to your team until you hear a giant boom. You first of all, have to have all 10 missions beat. Along with that, all the secret items in each mission are required. After that, make your way to the mini-games, and complete every mini-game in all 4 category’s. Once all the medals from the mini-games are collected, the game should read 100%. Sadly, no. I would recommend getting the original game called “Club Penguin: Elite Penguin Force” for the DS. It has way more content than this game, and offers you to roam around the game once you’ve beaten it, and buy clothes. You need to hook your DS up to Wi-Fi. Wi-Fi can be found in your house if you have a wireless router, or you can go to a free Wi-Fi place like Starbucks or McDonald’s for Wi-Fi that offer hot spots. After you connect up your Wi-Fi, link your account to your DS and follow the on-screen insturctions. Go to ClubPenguin.com and visit their support center for more help. You can also look in your instruction manual for more information on your Wi-Fi problems. Sorry for not having mission 10. Coming soon next week! Thank you. umm can you tell me how to get the stuff u collect in herberts revenge on to your penguin please! If you do Ill give you an unused coin code I bought yesterday! Series 10! Why isn’t there one for the ninth? what about the two extra doors in misson one and how do you get more stuff for ur penguin in the but not in the missons?